Many of God’s kids have gone through an intense warfare season. Some have been wounded by sickness, others by betrayal or rejection, and many others through hardship and losses. The message in this Heart Word Encouragement is to not focus on what happened at the devil’s hands, but rather on what the Lord is saying now to those who persevered, overcame and did not throw in the towel. I am sharing this now after almost a year of preaching this message because I have gained greater understanding and authority along the way. I will be sending out a few words this week to close out this year and launch us into 2016! Get ready to arise in the Lord’s authority! It was a powerful impartation into my heart and spirit as the words literally reverberated with the vibrations of our Father’s voice. I could feel the words go deep into me. I can also say that as I have shared this message, I have seen His authority manifest in a higher level than what I knew before. I would like to break down each word and the meaning the Lord gave to me. I hope you will allow the Voice of the Lord to speak this into you. (We will make a link to this message available to you on our website). Let’s look at the crown. 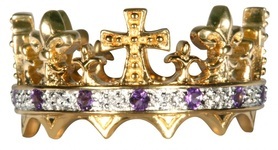 Jewels in a crown represent the wisdom, wealth and resources, and instruments the crowned one’s dominion possesses. Crowns are normally worn during ceremonial processions and at times of formal service such as: court, judgment, or promotion. Crowns in Bible imagery signify what the wearer has accomplished, conquered, and gained rule over. Redeeming love crowns you as royalty, guiding you into the fullness of humility and surrender, Even a King is held captive by your beauty! How delightful and pleasing you are to Me. As I count all your delights—Love has become the greatest! You stand in victory above the rest, stately and secure. As you share with Me Your vineyard of love. We need to see every victory won as a crown for Jesus. Even if the victory is that we did not quit, this indeed is a huge victory of perseverance. The crowns we will place before Him will reveal every battle won. All of this is for the Lamb of God to receive the reward for His suffering as the Moravians declared. The key to remember for today is: your crown reveals all the authority, wisdom, power, and authority of our God and King. In the heavenly realm it states to every power and principality whose kingdom you belong to. It speaks of His authority, all He is, and all He has backing you up. This crown also speaks of promotions coming to those who have persevered. Get ready to receive ALL authority in Christ Jesus! I had a dream a few months after the Lord gave me this revelation. In the dream a huge crown was coming down upon me, covering every part of me. My daughter was standing in front of me and she said, “The Lord is crowning you with loving kindness”. What a gift for us! I have felt this crown come upon me when I share this word. May you also receive the impartation. There is only One Exalted, One Powerful, One King over all. Our King rules over all; He is victorious and has overcome! Our authority comes from God, the King of ALL the universe. Jesus was given ALL authority and power and He has given this to us. Our kingly anointing is walking and talking in this realm of authority. Many operate in power, but do not understand authority. Demons shudder when someone comes in authority. When we know who we are in Christ and walk in the revelation of authority, we bring heaven’s transforming power to earth. This is where powerful decrees and declarations released from heaven’s realm into earth shift and change situations and outcomes. Some Jews who went around driving out evil spirits tried to invoke the name of the Lord Jesus over those who were demon-possessed. They would say, “In the name of Jesus, whom Paul preaches, I command you to come out.” Seven sons of Sceva, a Jewish chief priest, were doing this. [One day] the evil spirit answered them, “Jesus I know, and I know about Paul, but who are you?” Then the man who had the evil spirit jumped on them and overpowered them all. He gave them such a beating that they ran out of the house naked and bleeding. When this became known to the Jews and Greeks living in Ephesus, they were all seized with fear, and the name of the Lord Jesus was held in high honor. Many of those who believed now came and openly confessed their evil deeds. Are you yoked with Jesus and His wisdom, humbly and fully submitted to God, resisting the devil and your own flesh? (See James 3 & 4) Or has Humility been a garment shunned, instead choosing to walk arrogantly proud of self and seeking worldly pleasures? I have been shown many will not be able to stand in the days to come because of compromise. The enemy will have access to harm them severely unless humility is truly embraced. Authority comes to the humble and broken. Brokenness is a gift. Our weaknesses are gifts that cause us to know we need the One who is stronger to replace our weakness with His strength. It is a divine exchange. It is our covenant with Him. Let’s look at the Signet Ring. For the marriage-like covenant between the regent and his or her God. ​*Covenant (Prophets Dictionary): ​agreement, accord or contract between 2 parties where the greater one forges a union that achieves a common goal that fortifies the lesser one’s quality of existence. The spirit of covenant upgrades and enhances the lesser one’s position in life. Signet rings (ask.com; ehow.com): worn by highly decorated warriors as a sign of victory. God has made covenant with us. He gives us His signet ring. Look at the life of Joseph: he went through many trials, betrayals, being thrown into prison and forgotten. Yet the Creator of the universe had a plan to save a people during drought. God truly works all things together for good. Because Joseph embraced process, he came out receiving favor and authority, being given the king’s signet ring. In Esther, we read a story of overcoming through being in the right place and surrendering to the Lord’s will, even if it means death. In Esther 8, Mordecai is given the King’s signet ring. He then writes a decree to be sent into the kingdom that overturns Haman’s demonic decree that would have killed all the Jews. This decree is sealed with the King’s signet ring of authority. The Lord says we are His signet ring. Authority comes when we overcome…when we embrace suffering love with Christ Jesus, the Father will bring us through every trial and extend His scepter of favor granting us His signet ring of authority. We carry His authority when we yield to His heart. When His heart resonates in ours, we become the voices that decree His will on earth. Tracee Anne Loosle © 2015 May be copied or distributed for personal study or instruction but shall not be copied and/or distributed in whole or part for financial profit.